I recently mentioned the Veronica Speedwell series, and a fellow librarian said it was one of his favorite series. Yes, mine too. 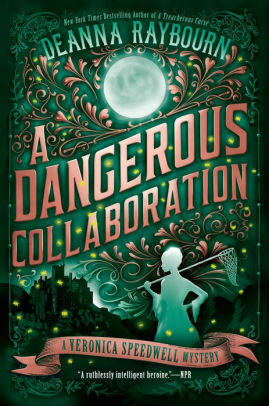 Deanna Raybourn's adventurous Victorian lepidopterist and her fellow natural scientist, Stoker, are intelligent and witty with sparkling conversations and numerous jabs at each other. The country house mystery is intriguing in the fourth in the series. But, it's the sexual tension that dominates their latest exploit. Veronica and Stoker's last adventure, chronicled in A Treacherous Curse, took a great deal out of both of them, so Veronica went to Madeira for six months. The two are still barely speaking to each other when Stoker's older brother, Tiberius, Lord Templeton-Vane, asks her to accompany him to the island of St. Madden, off the coast of Cornwall. St. Madden is owned by Malcolm Romilly, Tiberius' best friend from his school days. He's hosting a small party. Veronica isn't eager to go until Tiberius bribes her with a promise of Romilly Glasswing butterflies. It's only when it's too late to back out, on the train to Cornwall, that Tiberius informs Veronica he wants her to act as his fiancee. She reluctantly agrees, but it's even harder to fake that arrangement when Stoker shows up uninvited. However, Tiberius has his reasons. Malcolm Romilly's house party is three years after his bride, Rosamund, disappeared from the island on the day of their wedding. The events surrounding Rosamund have haunted Malcolm ever since, and he wants answers. Veronica and Stoker are always up for a new mystery and adventure, no matter how strange it might appear. Raybourn's latest is a captivating, atmospheric story of folk tales, ghosts, and mystery. There are poison gardens and village women with the sight. Veronica hears stories of mermaids and smugglers, and she and Stoker explore secret passageways and hidden rooms. However, even when Stoker and Veronica are barely speaking to each other, the chemistry between the two dominate the book. If you've been following the series, or, if you're new to it, Raybourn can capture that emotion in just a sentence. My favorite line from this latest book? "He put out his hand and I took it, feeling the whole world in the warmth of that clasp." A Dangerous Collaboration by Deanna Raybourn. Berkley, 2019. ISBN 9780451490711 (hardcover), 336p. FTC Full Disclosure - I received a copy from the publisher with no promises that I would review it. Note: Deanna Raybourn recently appeared at The Poisoned Pen Bookstore in Scottsdale, Arizona. She and Barbara Peters, the owner of the bookstore, had a fascinating conversation about Victorian women and their adventures. You can watch that conversation here. I love this series and for the first time in a long time I am eagerly waiting for this book to arrive in our local book store. I'm already waiting for the next book, SKyla. Loved this one! This is another series that I have to catch up with...Thanks for the reminder. You should, Gram. You're welcome.